Don’t miss out on Western Canada’s largest boat show, the 2019 Vancouver International Boat Show! 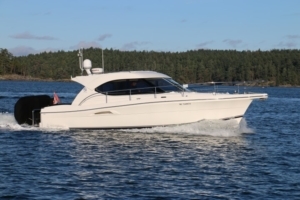 This boat show takes place from February 6-10 at BC Place and the Granville Island marina. Hundreds of boats are for sale from Wednesday to Saturday 10 am to 8 pm and Sunday from 10 am to 5 pm. Our brokers will be happy to tour you around our boats on display. Find us at Granville Island, G Dock 11,13 and 15. The sophisticated design of the 52’ Riviera Flybridge exudes effortless power. Rare seafaring affinity and operational ease. Uncompromising Riviera quality and attention to detail throughout. Flowing saloon and cockpit space, three staterooms, two bathrooms, spectacular luxury flybridge with internal staircase access, embracing the world’s easiest joystick helm maneuverability and control with Volvo Penta Glass Cockpit Navigation and silky smooth Volvo Penta Integrated Propulsion System (IPS) power. This exciting new model incorporates great function and style within a supremely comfortable, sea-kind hull. When it comes to propulsion, the proven Volvo Penta Inboard Performance System (IPS) has allowed Riviera designers to create a fresh accommodation layout on the new 43 Open Flybridge. With all major engineering positioned well aft, enormous gains are made with beam-width space amidships. Cruising at 28 knots with a top speed of around 31 knots, the 43 Open Flybridge has a range of 340 nautical miles from its 476 gallon tank. And of course handling the new 43 Open Flybridge in close-quarters is made care-free via the use of the integrated joystick control. 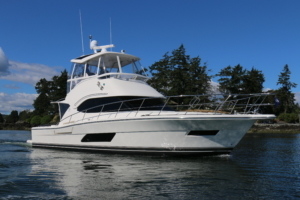 This particular boat is equipped with two 12″ Garmin Glass Bridge GPS screens, integrated GRID controller autopilot helm. Garmin GSD 26 CHIRP sounder and transducer, 4 KW Open Array Radar. The Riviera 3600 Sport Yacht is a superb example of forward thinking, combining the best of the past with innovative new thinking to forge an exciting future for boating enthusiasts everywhere. The Riviera 3600 Sport Yacht provides the very best in al fresco living with a single-level design combined with the comfort of a fully enclosed living area and helm station. The saloon and galley are on one level, and flow as one space into the cockpit via a large door and wide folding window. The cockpit is equipped with a lounge across the transom and a table that adjusts from compact coffee table size to an extended dining table. 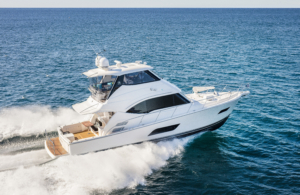 Built to the exacting standards that epitomize Riviera, the 3600 Sport Yacht offers the security of a hand-laid fiberglass hull with independent compartments and a watertight collision bulkhead forward. The innovative and highly efficient Frank Mulder designed tunnel hull and underwater exhaust systems, deliver a “big boat” ride and feel. Equipped with the factory optional hardback enclosure for comfortable year-round cruising! Back Cove has become synonymous with motor yacht cruising in affordable and easily maintained yachts. Practical elegance speaks to the simplicity and serviceability of her systems and to the gracious lines of the down east motor yacht. The Back Cove 32 is the latest model to be launched in a range that spans more than 700 hulls and 14 years. New to the Back Cove range for 2018, she is an amalgam of design ideas coming from discussions with our current owners and potential owners, about the ways in which they use their boats. 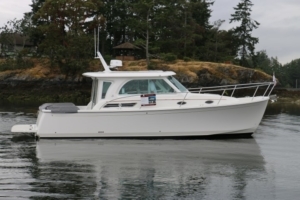 The Back Cove 32 offers the same concepts that have built the success of the range. Extraordinary fuel efficiency from her single diesel engine, straight forward systems and rugged good looks that are the talk of any harbor she enters. While her on-deck spaces are perfect for entertaining family and friends, her cozy and luxurious interior perfectly suits the needs of the cruising couple. The skilled boat builders at Back Cove have crafted a warm and inviting interior using American cherry, finely finished with satin varnish. Click HERE for more videos and photo galleries including our Historic Galleries. Click HERE for a photo tour of our marina.